As I said in my review the other day – there have been three books released to commemorate the 10th anniversary of Haakon and Mette-Marit’s marriage. This is the second one I’m reviewing. 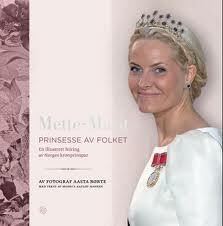 It is called Mette-Marit: Prinsesse av folket. En illustrert feiring av Norges kronprinspar, (Translation: Mette-Marit, Princess of the people. An illustrated celebration of the Norwegian Crown Prince Couple) with pictures by Aasta Børte and text by Monica Aafløy Hansen. This is a an album of pictures from the ten years Mette-Marit has been in the spotlight as the Norwegian Crown Princess. But, it is not just a pictorial – in some of the chapters, the text also feels as though it is an integral part of the book and not an afterthought. At 127 pages, the content and quality of pictures makes it feel like a lot more pages than it actually is. I really enjoyed reading the anecdotes from the photographer that sometimes accompanied the text, or the pictures. It gives another dimension to the book – I might have seen the pictures before, but the photographer’s description adds an extra value to the pictures. The chapters are thematic, rather than trying to do the pictures chronologically. On one hand, I think they succeed doing this, but on the other hand, a chronologic pictorial would also have an interesting element. The three main parts of the book is “In the name of love”, “Representing” and “Just for fun”. The latter covers her fashion choices and jewelry. Unlike the two other books, the topic of this book is chiefly focusing on Mette-Marit, and makes no bones about it. It is not overly sweet, and fluffy. All in all, I think this is a good representative book with pictures of Mette-Marit’s first ten years as a Crown Princess of Norway.